This charming little historical stocking filler is a collection of obscure British curry recipes from medieval times to now. The authors have unearthed some never-before-published gems. They show that the British love of curry goes back a lot further than chicken tikka masala and the text is dotted with well-chosen illustrations such as old labels for "currie paste" or Bombay duck (actually a kind of dried fish and nothing to do with duck). In The Road to Vindaloo: Curry Cooks and Curry Books authors David Burnett and Helen Saberi trace the rise of curry from its first awkward, but welcomed appearance in England to its current status as one of the most popular foods in Britain. The book is artful enough to hide the deep scholarship that has gone into the research, and even a casual reader easily sees the develoment. The authors have organized ten chapters on the rise of curry, each reflecting the social modes, often trade currents, as the English discovered their passion for curry. The result is a peek into history that only food history offers - it is history writ small, without declarations of war, one that reflects the modes and mores of people who lived, breathed, and oh yes, ate. With a brief acknowledgment to the long history of spices and the spice trade, the authors turn to cookbooks. They begin in the beginning with the stalwart Hannah Glasse, whose work is a delight to the curious and a jewel to serious researchers. Her cookbook, the 1747 The Art of Cookery Made Plain and Simple, presents the first mention of that which would evolve to be curry. Though her lone recipe mentions only coriander and black pepper, nowhere near the subtlety and complexity of the authentic, curry had found its first voice. The authors continue with early recipes, none of which rise to the authentic, but indicate the desire for well-spiced food. We meet unknown writers as well as the famous Eliza Acton and the Mrs. Beeton. Reading the work of the early cooks, the surprising discovery is the vast numbers of Indian recipes for chutney in addition to the several curry powders. More startling yet is that the first solid information emerged in Scotland through the work of Blanche Hulton whose grandfather spent 23 years in India (beginning in 1817) for the Honorable East India Company. Formed for trade with the Indian subcontinent and Southeast Asia, the presence of the East India Company is a reminder of the long, often rocky relationship between England and India. Progressing through time in a gentle amble, the authors glimpse the clubs “for officers and gentlemen,” many of which became most famous for their curries. Here we discover the division in Indian cooking between “Mussulmans and Hindoos.” Not only does knowledge deepen, but the recipes grow more authentic, though still not as nuanced as a true Indian cook would have it. They peer into the Officers’ Mess where curry was the standard lunch, and introduce us to the “Escoffier of the Raj,” Arthur Kenney-Herbert (aka ‘Wyvern’) who wrote a column for a local Indian newspaper and was the most influential contributor to curry literature by an English writer. Here we must smile, for Wyvern, writing in 1878 was struggling to find authenticity while complaining that many of his contemporaries were not taking as much care in preparation as the preceding generation. Like many of today’s cooks who will buy a prepared ragu and doctor it to their own tastes, he reluctantly allows a ‘stock’ powder as it may be doctored to taste and glory. The authors continue through time, noting the acceptance of curry by the royal houses via the great French chef, Carême whose recipe, the authors calculate, would take a fortnight to make and cost 300 pounds. They examine the excesses of the elaborate Victorian table where curry was set in pink aspic jelly, and move into the contemporary infatuation which has given rise to the production of authentic curries which are available in carry-out shops or on market shelves. Through their use of the authentic recipes we meet some fascinating, curry-obssessed characters. We see, not only the development of curry through the years, but also the change in recipe writing from a casual reference book for housewives to the more exact recipes that are written today. We wish we could know some of these characters who worked so diligently to reproduce the authentic, to ask them what their personal fascination was, what motivated them to record every detail so diligently. We suspect it was not only a love for curry, but also for India that motivate these diligent cooks. The recipes that are offered through out the book range from the untested but authentic old recipes, presented as written, to ones that the authors themselves have tested. There are full glossaries, the best we’ve read, and an index as well as photographs and prints from old India. This is a rich and satisfying book, as nuanced as curry itself. Chips and: curry sauce, with a deep-fried. Bounty bar for afters. Is this the limit of Indian cookery in Scotland? Far from it… English prejudices aside, not all food north of the border is bland pies and porridge. In honour of St Andrew’s Day we should celebrate the Scottish liking for spice, Curry devotees sang that some of the best Indian food in the British Isles can now be had in Glasgow. Since the 1990s Mother India and its sister restaurants (including the Wee Curry Shop) have been setting up a refined version of Indian cuisine, far removed from blow-your- head-off lager curries. At Mother India you can eat ginger and green chilli fish pakora; cardamon-rich butter chicken; home-made paneer with spiced broccoli; or smoky aubergines. It recently opened an outpost in Edinburgh serving tapas-style dishes for about £3 to £5 each. 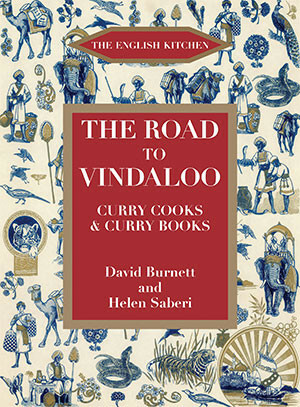 The Scottish love of curries goes back a long way as a captivating new book (the perfect little Christmas stocking-filler) demonstrates: The Road to Vindaloo (Prospect Books £9.99), by David Burnett and Helen Saberi, tells the story of British curry, from the Empire to the present day. The authors have dug up a treasure-trove of Scottish curry recipes from the 18th and 19th centuries. We often talk of Anglo-Indian food – tea and tiffin taken in posh English accents at 4 o’clock – and forget how many Scots also came home from imperial service with a taste for chillis. Take Sir Ronald Martin. He was born on the Isle of Skye in 1796 and spent 2 years in India treating tropical diseases. When he settled back in London in 1840 he became famous for his curry dinners, attended by Florence Nightingale among others. The proud host showed off the recipes he had collected from the courts of different rajas. The dishes may not have been quite like in Calcutta. Green apples or rhubarb replaced mangoes for chutney. Curry paste was slathered on fried bread. And Sir Ranald showed his Scottish ancestry when he made kebabs (‘Hooseinee Curry’) from cold mutton. He was a stickler, however, for authentic spicing. His own recipe for curry powder is a cracker, heady with powdered cloves and coriander. The Road to Vindaloo includes Scots recipes for chicken curry from the 1780s, as cooked by the granddaughter of the Laird of Craig. Sometimes the chicken vas rubbed with curry powder, then fried with butter and lemon pickle. Other times it was stewed with onion and gravy, with curry powder added at the end with flour to thicken and cream to enrich. These old recipes may not have the finesse of Madhur Jaffey (there is a notable lack of fresh herbs), but no one could accuse them of blandness. Mrs Dalgairns’s recipe for ‘Knebobbed Curry’ from 1829 calls for a large tablespoon of curry powder and a whole pungent head of garlic. Nineteenth-century Scotland had a passion for curry soup. This makes sense. For what is mulligatawny but a fierier version of Scotch broth? Another Caledonian favourite was rabbit curry. In 1826 Meg Dods, a Peebles landlady who cooked for Sir Walter Scow, made her rabbit curry with fresh coconut, mushrooms and tamarind or lime juice, along with an inimitable Scottish touch – streaky bacon. Dods suggests another reason why the Scots were so fond of curry: it is, she remarks approvingly, very ‘economical’.